A US museum says an Impressionist painting which President Donald Trump reportedly claims to own is a fake. In a recent interview, Trump biographer Tim O'Brien said he was once told by the future president that his artwork was an original. 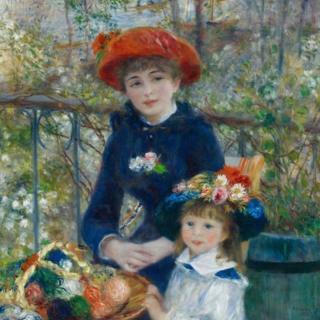 But the Chicago Institute of Art says the real painting, Two Sisters (On The Terrace) by Pierre-Auguste Renoir, has hung in its gallery for 80 years. A museum spokeswoman said "we have had this authentic painting" since 1933. "We're proud and grateful to be able to share this exceptional work of art with our 1.5 million visitors each year," Amanda Hicks said in an email to the BBC. The painting was given to the institute in 1933 from a donor who bought it for $100,000 (£76,000). The donor acquired it from an art dealer who purchased it directly from the French Impressionist painter in 1881, she added. But Mr O'Brien said during a recent interview with Vanity Fair's Hive podcast that Mr Trump has repeatedly claimed to him that his version of the painting was authentic. During a flight on Mr Trump's private jet while he was writing his 2005 book, TrumpNation: The Art of Being The Donald, Mr O'Brien said he spotted the painting and asked about it. "You know, that's an original Renoir," the author said Mr Trump had told him, adding that the property tycoon repeated the claim the following day. "Donald, it's not," he recalled telling Trump. "I grew up in Chicago, that Renoir is called Two Sisters on the Terrace, and it's hanging on a wall at the Art Institute of Chicago. The artwork was later apparently moved to Trump Tower, the author said, noting that it was visible in the background of a CBS 60 Minutes interview that Mr Trump gave shortly after the presidential election. "I'm sure he's still telling people who come into the apartment, 'It's an original, it's an original,'" Mr O'Brien said on the podcast. Mr Trump sued Mr O'Brien for $5bn because the author wrote in TrumpNation that rather than being a billionaire, his net worth was actually as low as $150m. The defamation lawsuit was dismissed.